Khemraj Pooranmanll confirmed his status as the country’s top draughts player by winning the Open and the 100-squares competition last weekend at the National Gymnasium, a press release from the Guyana Draughts Association stated. Playing in the GDA Trophy Stall-sponsored Open competition on Saturday Pooranmall had to pull out all the stops before emerging as the sole winner. Pooranmall ended the Open competition in a three way tie with Steve Bacchus and Navin Megbarran and after the usual tiebreak to decide the winner he was declared champion with Megbarran second and Bacchus third. In picture: sitting: from left Khemraj Pooranmall and Ulric Braithwaite. Standing, Steve Bacchus, left, Navin Megbarran, centre and Jairam. Jiaram and Bacchus were in the lead going in the sixth and final round with 12 and 13 points respectively but Pooranmall stormed back with an upset win to end on 15 points the same as Bacchus and Megbarran. Early leader Jiaram also ended in a tiebreak and duly dispatched both Francis and Yearwood to claim the fourth position. On Sunday, in the International 100-square board, Jiaram and Pooranmall went into the final round with nine points each and Jiaram’s defeat by Pooranmall gave him a double crown with Jairam second while Bacchus and Ulric Brathwaite were third and fourth respectively. 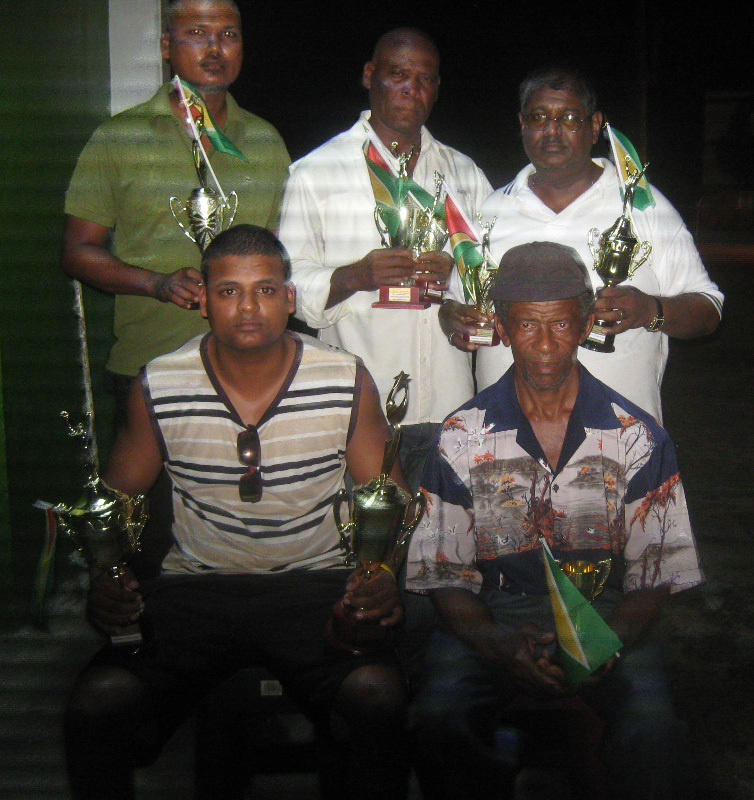 All four players had competed in International competitions in top Draughts playing Nation Suriname. Trophies donated by Trophy Stall and the National Sports Commission were awarded to the top players. Prior to the commencement of the tournament, GDA president Jiaram welcomed the players and congratulated them for their involvement in the Jubilee celebrations. The GDA also expressed its gratitude and thanks to Ramesh Sunich of Trophy Stall Bourda Market, executives of the National Sports Commission, Mr. Lalta Gainda of Rubis Bel Air and Southland International.